Mubarak Mystery: In Egypt, In Germany, In Coma? Many aspects of Hosni Mubarak's life - from his health to his wealth to his daily whereabouts - were closely guarded secrets during his nearly 30 years as president of Egypt. After being ousted from office last week, not much has changed. 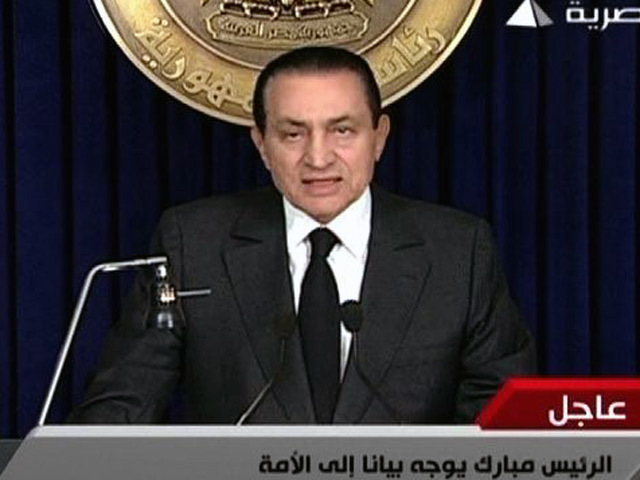 The Egyptian daily Al-Masry Al-Youm reported Sunday that Mubarak had slipped into a coma. The paper repeated rumors that the 83-year-old former head-of-state also fainted twice during his infamous I-won't-quit speech last week, delivered just a day before he did indeed step down. Another report, from an Israeli French-language magazine named JSS News, claims that Mubarak was on death's door in a hospital in Baden, Germany. Mubarak has long been rumored to be suffering from cancer, and JSS News claims that he is already in the terminal phase of his cancer suffering. Despite these rumors, an Obama administration official told a reporter at the Washington Post Sunday they believed he was actually in the seaside resort town of Sharm el-Sheikh, where he has long had a private residence. Egypt's prime minister also supported this report. Still, several locals in Sharm el-Sheikh also told the Post they believe that, while he did immediately flee for the resort town after resigning, he quickly boarded a plane for Abu Dhabi and then continued on to Germany. For their part, the Germans call this theory nonsense. "He's not in Germany, and he's not on his way," Steffen Seibert, the chief spokesman for German Chancellor Angela Merkel, said Sunday night, according to the Post. "This is a new round of rumors. There is absolutely no information that we have about this, and it would require him a visa to come here. So presumably we would know." If Mubarak is indeed gravely ill, there is still uncertainty about how he would pay for medical treatment. Widely rumored to have accumulated billions of dollars in personal wealth during his presidency, Switzerland announced after Mubarak stepped down that it had frozen his and his family's assets in their banks. Egypt's ambassador to the U.S. said Monday that Mubarak may be in "bad health" on NBC's "Today." He did not offer more specific information.